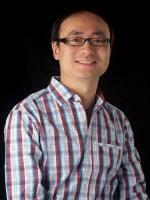 The central theme of Dr. Fang's research is to investigate the structure-function relationships of biomolecules and novel materials, ranging from fluorescent proteins which can light up subcellular entities for bioimaging, proteins and enzymes that are potential targets for biomedicine, to nanoclusters and metal-organic complexes in solution. The interplay between chemistry, physics, and biology greatly facilitates ultrafast spectroscopic advances in the molecular vibration domain, which include FSRS (femtosecond stimulated Raman spectroscopy) annd 2D IR (two-dimensional infrared spectroscopy). The real-time structural snapshots of molecules "in action" offer unprecedented mechanistic insights on the intrinsic molecular timescale (10 fs - 1 ps) critical for their specific functions. In particular, photoswitchable and calcium-sensing fluorescent proteins are studied by FSRS to reveal the atomic choreography of the "flexible" chromophore inside the protein pocket upon photoexcitation and calcium ion binding. Functional motions of photoacids and other photosensitive materials during chemical reactions in condensed phase will also be elucidated. Weimin Liu, Yanli Wang, Longteng Tang, Breland G. Oscar, Liangdong Zhu, and Chong Fang (2016) "Panoramic portrait of primary molecular events preceding excited state proton transfer in water", Chem. Sci., 7 (8), 5484-5494. DOI:10.1039/C6SC00672H. Longteng Tang, Weimin Liu, Yanli Wang, Liangdong Zhu, Fangyuan Han, and Chong Fang (2016) "Ultrafast Structural Evolution and Chromophore Inhomogeneity Inside a Green Fluorescent Protein Based Ca2+ Biosensor", J. Phys. Chem. Lett., 7 (7), 1225-1230. DOI: 10.1021/acs.jpclett.6b00236. Breland G. Oscar, Weimin Liu, Nikita D. Rozanov, and Chong Fang (2016) "Ultrafast Intermolecular Proton Transfer to a Proton Scavenger in on Organic Solvent", Phys. Chem. Chem. Phys., 18 (37), 26151-26160. DOI: 10.1039/C6CP05692J. Fangyuan Han, Weimin Liu, Liangdong Zhu, Yanli Wang, and Chong Fang (2016) "Initial Hydrogen-Bonding Dynamics of Photoexcited Coumarin in Solution with Femtosecond Stimulated Raman Spectroscopy", J. Mater. Chem. C, 4 (14), 2954-2963. First published online 02 Dec 2015. DOI: 10.1039/C5TC03598H. Part of Themed Issue on Shape-Responsive Fluorophores. Liangdong Zhu, Sumit Saha, Weimin Liu, Yanli Wang, Douglas A. Keszler, and Chong Fang (2015) "Simultaneous solution-based generation and characterization of crystalline bismuth thin film by femtosecond laser spectroscopy", Appl. Phys. Lett., 107 (6), 061901. DOI: 10.1063/1.4928483. Published on Web: August 10, 2015. Liang Wang, Weimin Liu, and Chong Fang (2015) "Elucidating Low-Frequency Vibrational Dynamics in Calcite and Water with Time-Resolved Third-Harmonic Generation Spectroscopy", Phys. Chem. Chem. Phys., 17 (26), 17034-17040. First published online 04 Jun 2015. DOI: 10.1039/C5CP01813G. Longteng Tang, Weimin Liu, Yanli Wang, Yongxin Zhao, Breland G. Oscar, Robert E. Campbell, and Chong Fang (2015) "Unraveling Ultrafast Photoinduced Proton Transfer Dynamics in a Fluorescent Protein Biosensor for Ca2+ Imaging", Chem. Eur. J., 21 (17), 6481-6490. Published on Web: March 11, 2015. DOI: 10.1002/chem.201500491. Liangdong Zhu, Weimin Liu, and Chong Fang (2014) “A versatile femtosecond stimulated Raman spectroscopy setup with tunable pulses in the visible to near infrared”, Appl. Phys. Lett., 105 (4), 041106 (5 pages). DOI: 10.1063/1.4891766. Published on Web: July 28, 2014. Breland G. Oscar, Weimin Liu, Yongxin Zhao, Longteng Tang, Yanli Wang, Robert E. Campbell, and Chong Fang (2014) "Excited state structural dynamics of a dual-emission calmodulin-green fluorescent protein sensor for calcium ion imaging", Proc. Natl. Acad. Sci. U.S.A. 111 (28), 10191-10196. DOI: 10.1073/pnas.1403712111. Published online before print: July 1, 2014. Wei Wang, Weimin Liu, I-Ya Chang, Lindsay A. Wills, Lev N. Zakharov, Shannon W. Boettcher, Paul Ha-Yeon Cheong, Chong Fang and Douglas A. Keszler (2013) "Electrolytic synthesis of aqueous aluminum nanoclusters and in situ characterization by femtosecond Raman spectroscopy & computations", Proc. Natl. Acad. Sci. U.S.A. 110 (46), 18397-18401. Published online before print October 28, 2013. DOI: 10.1073/pnas.1315396110 (Open Access). Weimin Liu, Fangyuan Han, Connor Smith, and Chong Fang (2012) “Ultrafast conformational dynamics of pyranine during excited state proton transfer in aqueous solution revealed by femtosecond stimulated Raman spectroscopy”, J. Phys. Chem. B, 116 (35), 10535-10550. DOI: 10.1021/jp3020707. Chong Fang, Renee R. Frontiera, Rosalie Tran, and Richard A. Mathies (2009) “Mapping GFP structure evolution during proton transfer with femtosecond Raman spectroscopy”, Nature, 462, 200–204. DOI: 10.1038/nature08527. Chong Fang, Joseph D. Bauman, Kalyan Das, Amanda Remorino, Eddy Arnold, and Robin M. Hochstrasser (2008) “Two-dimensional infrared spectra reveal relaxation of the nonnucleoside inhibitor TMC278 complexed with the HIV-1 reverse transcriptase”, Proc. Natl. Acad. Sci. U.S.A., 105 (5), 1472–1477. DOI: 10.1073/pnas.0709320104.